We are one of 220 Conservation Alliance member companies who care passionately about protecting wild places for future generations. We pool our funds and invest in land and water conservation projects that seek to protect our threatened wild places. 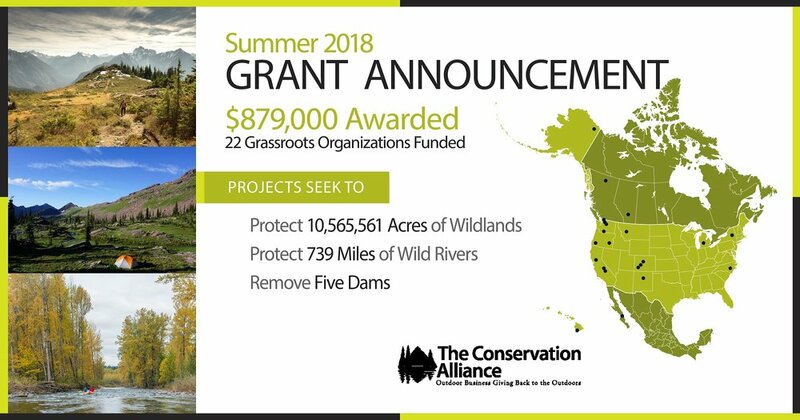 The Conservation Alliance just awarded 22 grants totaling $879,000 to grassroots organizations working to protect wild lands and waterways for their habitat and recreation values. This is their single largest grant disbursal since The Conservation Alliance was founded in 1989 and they are on track to award a record $1.9-million in 2018. Included in this round of grants are: nine private land acquisitions; five Wilderness and Wild and Scenic river campaigns; three agency management planning projects; one project that seeks to protect land and water threatened by energy development; one dam removal project; and three wild land protection campaigns. Collectively, these projects seek to protect more than 10-million acres, 739 river miles, and remove five dams in the US, Canada, and Mexico. Learn more about the specific projects funded during this grant cycle on The Conservation Alliance here. Follow The Conservation Alliance on Instagram and stay up to date.